Paperback 195 mm x 128 mm (73/4 in x 5 in), 286 pages. The independent press SF movement is one of the most dynamic literary scenes in Australia. This book captures the best of that movement, from Australia's best SF, fantasy and horror writers: both newcomers and those with established reputations. You'll find the traditional, the street-smart, the amusing and the adventurous. From urban fantasy to the myths, dreams, and search for meaning in the future; stories that explore mankind in a moment on the edge. This anthology series documents the best of the speculative genres in Australian writing. The joy of the written word as it was meant to be: inventive and challenging. 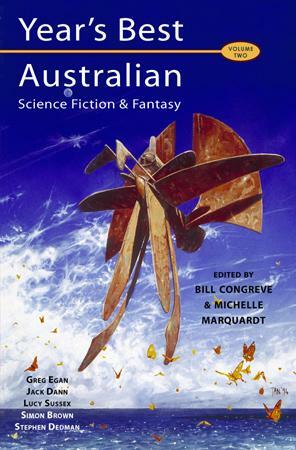 Supplementing the fiction is the editors' insightful summation of the field in Australia, and a list of recommended reading, making this volume a valuable resource as well as a one-stop, definitive volume of the best in Australian speculative fiction today. Bill Congreve: One of Australia's most experienced speculative genre editors and publishers, with anthologies such as Southern Blood shortlisted for awards world-wide. Reviewer for Aurealis magazine. Has also written a collection of vampire stories, Epiphanies of Blood. Shaun Tan began drawing and painting images for science fiction and horror stories in small-press magazines as a teenager, and has since then received numerous awards for his picture books, including the CBCA (Children's Book Council of Australia) Picture Book of the Year Award for The Rabbits with John Marsden. In 2001 Shaun was named Best Artist at the World Fantasy Awards in Montreal. He has recently worked for Blue Sky Studios and Pixar, providing concept artwork for forthcoming films. Simon Brown is one of Australia's leading fantasy authors, with trilogies from Harper Collins and Pan Macmillan, both of which have been reprinted in the US. His most recent book is Troy, a collection inspired by the histories and myths of Troy. His most recent fantasy novel is Rival's Son, the second novel of the Kydan trilogy. Jack Dann is the author of the Memory Cathedra, and one of the world's most respected writers of SF. He co-edited the anthologies Dreaming Down Under and Gathering the Bones. His most recent books include The Rebel: An Imagined Life of James Dean, and the collection, The Fiction Factory. His story here, about Marilyn Monroe, is one of a number chronicling an alternate America and the death of the American dream in the 1950s. Rjurik Davidson is a graduate of the Clarion South workshop, and has published stories in Fables & Reflections, Aurealis and SciFi.com. This is Rjurik's second appearance in the Year's Best series. Stephen Dedman is the author of the novels, The Art of Arrow Cutting, Foreign Bodies and Shadows Bite. His most recent book is the second of his short story collections, Never Seen by Waking Eyes. Greg Egan is a Hugo Award winning author of hard science fiction. His novels include Distress, Permutation City and Schild's Ladder. In recent years he has been heavily involved in the refugee rights movement, and is now hard at work on a new novel, Incandescence, set some three hundred thousand years after the events of 'Riding the Crocodile'. Dirk Flinthart has written in a number of genres, including crime, SF, fantasy, horror, and humour (with John Birmingham). These days he works mostly in speculative fiction. Leanne Frahm has been one of Australia's leading SF and horror writers since the 1980s. Though never prolific, she has twice won the Ditmar Award, and once the Aurealis Award. Five of her short stories have been collecting in Borderline. 'Skein Dogs' is her first published story for several years, and marks a welcome return to the genre. Martin Livings is the author of the horror novel Carnies about to be released by Lothian. His stories and reviews have appeared in publications such as Eidolon, Aurealis, Outcasts and Borderlands. Rosaleen Love's short stories have been published in three collections, most recently The Traveling Tide, in the US. Her non fiction includes Reefscape: Reflections on the Great Barrier Reef. Her story, 'Once Giants Roamed the Earth', has already won two awards. Ben Peek's first novel, Black Sheep, is forthcoming from Prime Books later this year. This story follows the form of a J.G. Ballard story, 'Answers to a Questionnaire'. This is Ben's second appearance in the Year's Best series. Lucy Sussex is the author of a number of novels, including Scarlet Rider and Black Ice, and the award winning editor of She's Fantastical, the Australian feminist SF anthology. Her most recent book is the collection, A Tour Guide in Utopia. Kaaron Warren's first book, the collection The Grinding House, won two Ditmar awards at the recent Conjure convention. She has been writing and publishing SF and horror stories for a number of years.